The recent Amazon/Whole Foods acquisition has ignited a firestorm of analysis and assessment concerning the impacts and implications. Some of the conversation has reached far and wide – from the future of supermarkets to outcomes for large CPG food brands and foodservice businesses. Here we help summarize how the food industry changes could manifest, as well as guidance on what comes next. Grocery leadership is rapidly becoming a two horse race between Walmart and Amazon, creating a new class of retail that blends online and physical store strategies. The ‘new last mile’ competition now moves to address the single biggest barrier to grocery e-commerce growth: fresh/perishable sales. Many consumers lack trust in online platforms to select and safely transport produce and proteins to their standards and freshness expectations. The future of supermarket companies shifts more towards ‘specialty retailer’ strategies focused on improved, curated grocery and perimeter businesses. Higher quality, unique products, local sourcing, improved Deli menus, Grocerant businesses, and heavier investment to in-store experience become the retail differentiator. The goal here is to leverage a physical advantage of tactile, higher quality food and culinary experience. E-commerce will be mission critical – that said, not likely anyone will catch up now to Walmart and Amazon. Costco maybe. Entry of Lidl, and Aldi growth investment will put pressure on pricing at all levels. Large cap CPG may take the brunt of this as their core categories continue to see challenges in the face of cultural shifts to preference for new, innovative and higher quality, artisanal brands and fresh versions of packaged items. This could force more M&A activity to satisfy Wall Street and engage balance sheet efforts to reduce operating costs. Retailers, increasingly on the hunt for innovation and better margin businesses, will up their game by putting more investment in their private brand programs – potentially surpassing legacy CPG brands on quality and uniqueness. Amazon will bring 365 to their Fresh platform. This, in turn, puts more pricing pressure on large CPG. Roughly half of casual dining restaurant chain sales are sourced from family occasions – and families have hastened the declining use of casual dining outlets, moving instead toward at-home meals. Primary reasons for the move back home are health (e.g., quality ingredients), preparation control and cost. The Amazon-Whole Foods combination could make at home/healthy meals easier and less expensive in ways that compete with supermarkets and restaurants. It’s possible that Amazon could become a top-10 restaurant chain (near the $5 billion in system sales of Panera Bread). By creating faster market share gains in perimeter categories, Amazon and Whole Foods will quicken the ongoing center-store rationalization. Sixty percent of Millennials are Amazon buyers (source: NPD Group). Twenty percent of American consumers bought at least one item from Whole Foods last year, however among Millennials, the number is substantially higher: 24 percent. This is extraordinary penetration for a supermarket chain with just 431 stores. The proposed deal gives Amazon control of those stores – nearly all of them are in neighborhoods that are more affluent and younger than America as a whole. 1. Unique and differentiated brands are now more vital than ever as competitive leverage for supermarkets. Brands that play to consumer sensibilities around higher quality ingredients, craftsmanship and visibility to creation stories, and mission (Higher Purpose) will be key to retail channel. 2. Deli marketing and merchandising programs become more critical to supermarket growth as center store rationalization picks up pace; a conundrum for food retail as this is traditionally where the profit often sits. Pricing pressures on large cap CPG will likely come from several fronts. More legacy brand declines could be on the way, amping the need for faster innovation. 3. A newly charged renaissance in home cooking will create more opportunities for brand growth as consumers look for ideas and inspiration to fuel their eat-at-home aspirations. Creative programming to leverage this condition is key. Emergent has developed a variety of content creation strategies to leverage this opportunity, which can be repurposed for retailer use on their own social channels. 4. Further erosion of the casual dining segment is likely to continue due to competition from supermarkets and Amazon/Walmart for prepared foods, kits and fresh food solutions for at-home meals. For multi-channel companies this condition might recommend greater investment now in retail channel development and brand marketing investments. 5. The emergence of new brands in center store and perimeter categories will create challenges for retailers. This is due to absence of scaled promotion budgets and higher product input costs contributing to higher prices on lower overall volume businesses. Retailers will need more sophisticated marketing and merchandising solutions to help nurture and grow these higher quality, boutique brands. The same holds true for CPG companies that invest and acquire these new, emerging brands that require a different formula to build scale. Emergent has designed a new Emerging Brand Marketers’ Playbook for this purpose. 6. Consumers are omni-channel shoppers. The move online will accelerate and reach a tipping point in the next two years. Fresh is the battleground. Brands need to be collaborative partners with food retail as e-commerce strategies gain traction and the need to address trust issues with fresh/perishable item shopping is key to growth. Emergent can help optimize omni-channel strategies. Who Do You Trust to Squeeze Your Tomatoes? “And they’re off!” could well be the call to action for last week’s industry-shaking announcement that Amazon has gone deep into the bricks and mortar food retail business with its historic acquisition of the upscale Whole Foods Market chain. This sets in motion the race for grocery supremacy and, in some cases, survival in food retail’s transformative future. Omnichannel shopping is a well reported behavioral change among consumers who may look to multiple retail outlets, as well as online formats to meet their various food shopping needs. So, the acceleration of e-commerce in concert with shifts in food retail business models is no surprise. What makes this marriage so interesting is the merger of Amazon and its algorithm mastery, distribution, and delivery prowess, with what may arguably be the largest chain of culinary-focused, fresh, and organic food stores. According to the U.S. Grocery Shopper Trends 2017 report, released by the Food Marketing Institute and Hartman Group, 43 percent of Millennials shop online for groceries at least occasionally, leaping ahead of 28 percent just a year ago. 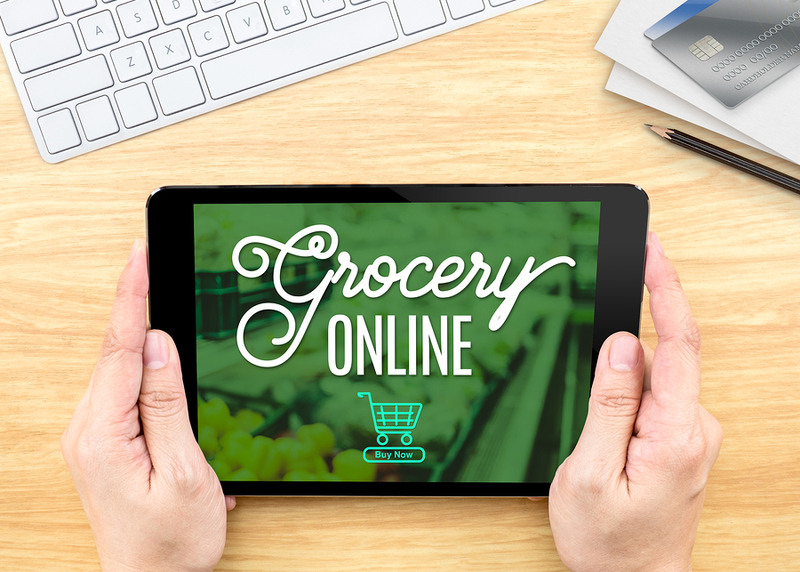 Apparently, consumers are getting (a lot) more comfortable using online platforms to get their food. That said, food is inherently an emotionally-driven category. And increasingly, people see food not only as a symbolic purchase of what we want the world to believe about us, but also is directly correlated to our overwhelming desire for a higher quality life. So what happens when food passion collides with food retailing technology? Therein lies the secret to this marriage’s success and, in many respects, the future of the entire food retail industry. How should you marry food cred and expertise to ordering and delivery tech? Trust looms large as a barrier to growth in e-commerce beyond the inherent attractions of convenience and price. People trust their own judgment when it comes to selecting perishables, especially produce and proteins. Case in point: I have exacting standards on the meat I will buy – and come to the butcher counter with an eye towards my own quality perceptions. Said more simply, I care and make careful choices. Why? I take great pride in the foods I prepare and the outcomes of cooking, where ingredients will often make the difference between so-so and terrific. Belief leads to trust. And how to cultivate belief? I want to know that the people involved with my food purchase care as much about the products and cooking as I do. What evidence is there in the form of relevant content that expresses passion for fresh ingredients, higher quality and creativity in the kitchen – which is then meaningful to me, and my lifestyle? When it comes to CPG brands and retailers, we already know Millennials are especially concerned about honesty and openness around the issues of animal welfare, sustainability, ingredient sourcing commitments and social responsibility. Combine this with the renaissance taking place right now in the kitchen, where fresh foods go to be reworked into something creative and exciting to eat. And right there you have the ingredients for building deeper meaning and relevance in how food brands and retailers go to market. As belief is created, trust is achieved. With trust, the barriers to having others squeeze your tomatoes will come down. In short, people need to believe that the faceless e-commerce platform indeed has a face and can be humanized around the love of food and how it’s prepared and consumed. Facts are this: at no other time in the history of modern marketing and business strategy have we seen such a pervasive shift – up. To be sure the Walmarts of the world continue and Dollar Stores are everywhere, but it can be said we are witnessing a call for quality, for real, for authenticity and improved experience that is steamrolling through the consuming marketplace with the speed of the latest viral video.